The famous Dutch brand – Bugaboo has recently released a new single all-terrain stroller – Bugaboo Fox which is going to replace the Buffalo stroller. What’s really great about Fox is that it has the best features of Buffalo but it’s much lighter, more agile and user-friendly. Bugaboo Fox is a single, convertible stroller that comes with a toddler seat and a bassinet. You can also easily turn it into a travel system, if you add an infant car seat compatible with it. This new stroller from Bugaboo is not expandable, like Donkey, but there is a possibility of adding a wheeled board – great solution for older toddler or preschooler. Brand-new Bugaboo Fox is to replace the Bugaboo Buffalo, which is also an all-terrain stroller, but much heavier and more difficult to push and steer on harsher terrain. Fox has many great features of the Buffalo but manufacturer also improved the functions that parents didn’t like on Buffalo. This new stroller weighs nearly 5 lbs less and you can actually feel it. Bugaboo Fox is not only multi-functional and user-friendly but it also looks beautiful, stylish and sophisticated. 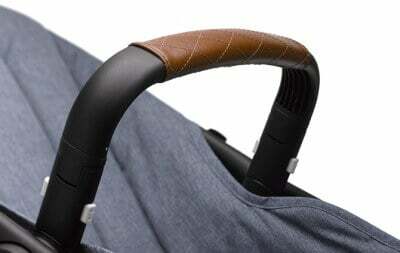 All the details are cleverly designed and the whole stroller is built to last. The fabrics are very rich, comfortable and soft to the touch. Did you know that you can create your own Bugaboo Fox? For example On PishPosh Baby you can choose the color of the frame, seat fabric, handlebar and wheel caps! 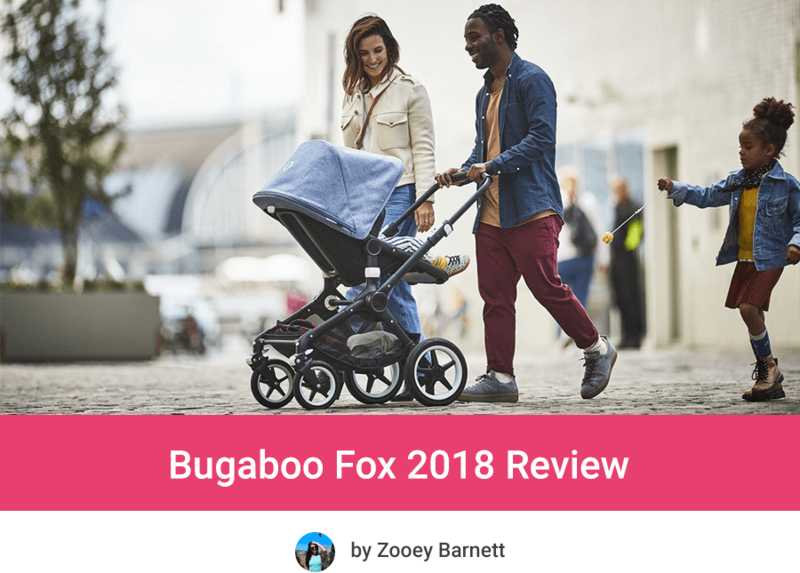 What other parents think about Bugaboo Fox? 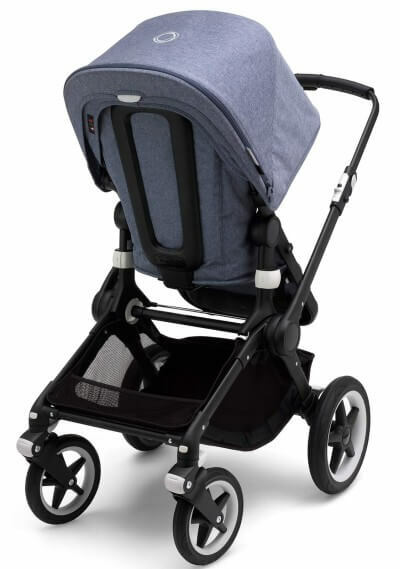 With Bugaboo Fox you get all the great features of Buffalo, but with many improvement. 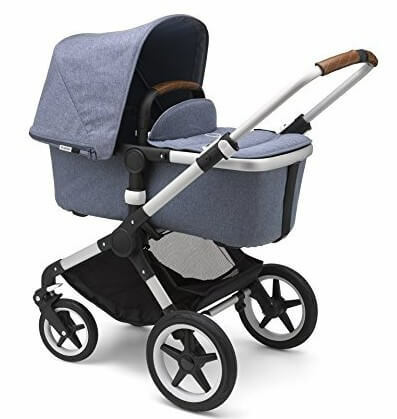 This stroller has also few useful functions of Cameleon, Bee and Donkey to provide parents and babies with the most comfortable and enjoyable ride. Bugaboo Fox comes with a regular toddler seat suitable for babies who have neck and head control. The weight capacity is 48.5 lbs. The seat is about 14 inches wide and 10.2 inches deep. It is roomy and comfortable even for a 3 year old child. The seat unit is removable – you can replace it by the bassinet or infant car seat. Moreover this seat is reversible which means your baby can ride facing you or the World, depending on his age and preferences. There are 3 reclining position. Fox has bucket type of seat which means the whole seat reclines, not only the backrest. I like that the recline is one-handed – you just need to squeeze a lever on the back of the seat. The deepest recline is not fully flat and the baby has his legs bent in this position so it’s not super comfy, but it’s sufficient for a short nap on-the-go. I like the most upright position which is pretty straight and allows the child to observe the surroundings. Great feature for toddlers who are very curious and want to see everything during the stroll. Bugaboo Fox seat is equipped with a bumper bar that rotates allowing the parent to take the baby in and out of the stroller really quickly. This belly bar has leather-ish cover which adds luxurious and sophisticated look. There is also 5-point harness with adjustable straps. To lock the harness we need to click each strap individually into the buckle in the middle, which may be a bit annoying but it’s something you can get used to. Just like other Bugaboo strollers, Fox has very generous canopy as well. There are three panels – the third one opens with a zipper. When the canopy is fully extended it almost touches the seat bottom. It’s amazing! The baby is covered from head to toe (in upright and reclined position as well), which means he’s fully protected from the sun rays. Of course you can use two panels (which also give good amount of shade for the baby), one panel or fold the canopy when you don’t need it. It’s a bummer that this high-end stroller doesn’t have peek-a-boo window so when the baby is sitting facing front you can’t keep an eye on him. 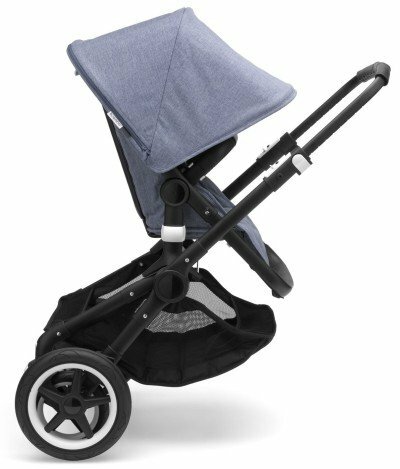 Bugaboo does offers Breezy Sun Canopy for Fox with mesh side vents, front zippered window and small peek-a-boo window. Unfortunately you have to pay extra for this hood. It is available in many different and colorful fashions (check price & available colors on Amazon). Bugaboo Fox Stroller comes with a bassinet so you can use it from birth. Attaching the bassinet to the chassis is very simple. You just need to remove the toddler seat unit and click in the carrycot which literally takes few seconds. 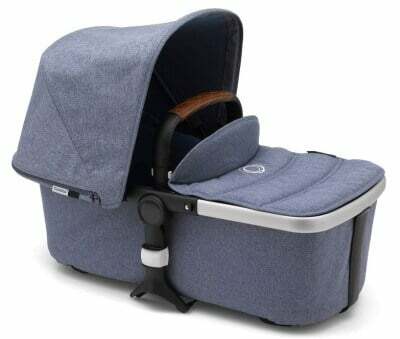 The bassinet is very deep and roomy and it provides completely flat position, suitable for newborn baby as it provides proper support for newborn’s spine. This bassinet is equipped with the same enormous canopy as the toddler seat. When you unzip the third panel, the sunhood touches the apron on the bassinet and fully shields the baby from sun and wind. The apron is attached with a zip and very easy to remove from the bassinet. There is also a carry handle for easier transportation. It is also covered with leather-ish fabric, just like the bumper bar on the toddler seat. Great thing about Bugaboo Fox is that you can fold it with the bassinet attached to the chassis! You just need to recline the bassinet (just like the toddler seat) and then fold the chassis. It will take up a lot of space, but still less than an open stroller. 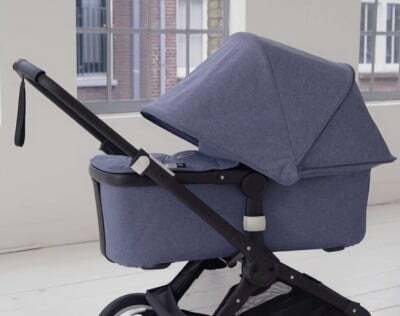 So if you want to save some space at home, but don’t want to detach the bassinet every time you come back from a stroll, you can easily fold it and store it with bassinet attached. Bugaboo Fox can be also used as a travel system. You can easily attach an infant car seat to the frame, instead of the regular seat and bassinet. This stroller is compatible with many popular car seat brands: Britax, Chicco, Cybex, Maxi-Cosi, Nuna and Peg Perego. Are you looking for a convertible stroller that you could use from birth till toddlerhood? Check my list of the best convertible strollers that have option of attaching bassinet or infant car seat. 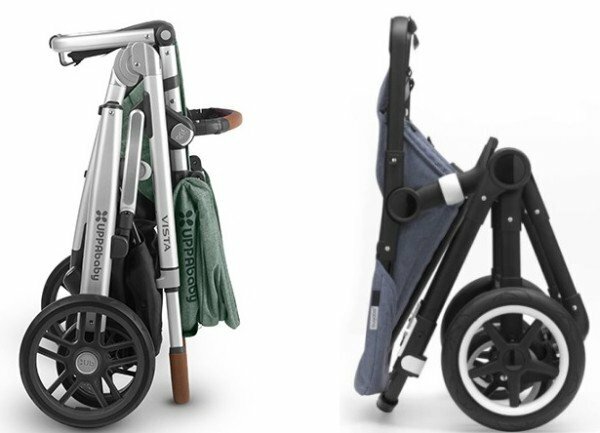 This new stroller from Bugaboo has height-adjustable handlebar. It easily telescopes in and out. There are few height settings, from about 34.6 to 42.5 inches from the ground so even very short and very tall parents can find a comfortable position and push Bugaboo Fox easily with one hand. To adjust the push bar height you need to unlock these two white buckles on both sides of the bar, slide it in or out, depending on your height, and lock the buckles again. Extendable handlebar is really awesome because it gives taller parents more space behind the stroller, in contrast to rotating handlebar which forces tall parent to stay very close to the stroller. With Bugaboo Fox tall parents with longer legs can comfortably walk behind the stroller without kicking the rear axle or wheels. 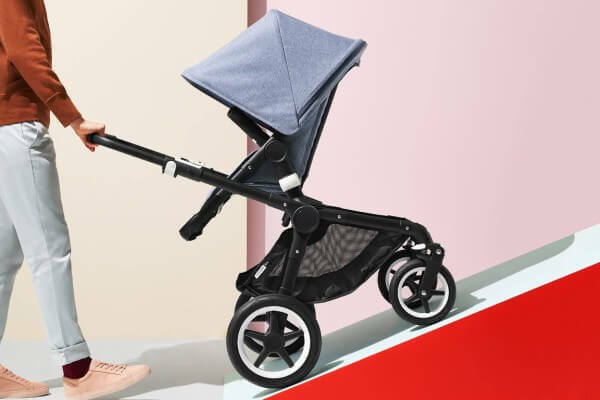 Moreover, the handlebar on Bugaboo Fox 2018 has leather-ish cover which gives the stroller more luxurious appearance. 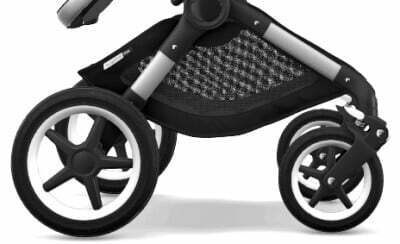 Bugaboo Fox has forever-air tires, the same that you can find on Donkey2 and Cameleon. They are really great because they can handle even rough, bumpy terrain and provide very smooth ride, but they don’t require inflating and you don’t have to worry about punctures. Front wheels are 8.5″ and swivel, which makes the stroller very agile and easy to maneuver, but they can be also locked straight for going over more difficult terrain. The rear wheels are 12″. There is all-wheel advanced suspension which really makes the ride more stable and cushioned. Maybe it’s not as smooth as with jogging strollers, but still it’s very comfortable and your baby won’t get bumped around. Thanks to big wheels and shock-absorbing suspension you can take Bugaboo Fox for a stroll to the woods as it will handle grass, gravel and bark chips. It’s also perfect for strolling around the city – cracked sidewalks won’t be a problem for this stroller. Moreover you can take it for shopping at the mall or quick trip to the grocery store as it’s very maneuverable and easy to navigate and turn. There is one more feature that I have to mention. You can put Bugaboo Fox into two-wheel position. 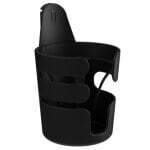 It’s a useful function, especially when you want to go through snow or sandy beach. Thanks to two-wheel position you can easily pull the stroller behind you. But I would recommend doing it without the baby in the seat as the stroller is less stable in this position and feels more heavy. This is the feature that I love about Bugaboo Fox! It has really awesome parking brake operated by foot. To lock the rear wheels you need to press a pedal, located next to the left rear wheel. The pedal has good size so you won’t have problem with reaching it or pressing it. To disengage the brake you don’t have to lift it, like in many other strollers (which is not very comfortable if you’re wearing sandals or high heels). Here you just need to press the pedal once again. Super smart! Engaging and releasing the brake is very simple and this is truly flip flop friendly brake. There is also one more awesome feature. There are also color indicators that show when the brake is engaged or disengaged. When you lock the wheels the indicator will be red and when you press the pedal again and release the brake the indicators will be green. There is one thing that you should keep in mind. The pedal is located very close to the basket so you need to be careful when pressing it, so you don’t touch the basket fabric. My tip: Don’t push the brake pedal with your whole foot, just use your toes. Spacious storage basket is another advantage of Bugaboo Fox. The basket has weight capacity of 22 lbs and can accommodate large diaper bag. The basket is easily accessible from behind the seat. When the seat is reclined you can reach the basket also from the front. This stroller is 23.6 inches wide so you will easily fit through doorways and elevators. Moreover, Bugaboo Fox 2018 is pretty light and easily to lift. It is much lighter than Bugaboo Buffalo and UPPAbaby VISTA. Fox weighs 21.8 lbs (with a toddler seat) which is not that much as for a full-sized, convertible stroller. Lifting or carrying it is not effortless, but totally doable. First of all, you can fold Bugaboo Fox Stroller with bassinet or toddler seat attached (front or rear facing). Folding is quite simple, but takes some practice. First you need to set the handlebar at the lowest position, then lift two buttons on both sides of the bar and lower the seat unit. Then you just need to pull the handle behind the seat and the chassis will close in half. There is automatic lock and self-stand for easier transportation and storage. With the seat attached the stroller takes up a lot of space, as the seat unit doesn’t fold in half (nor does the bassinet). 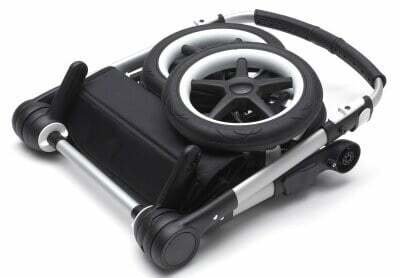 Dimensions of the Bugaboo Fox 2018 with seat: 15.7″ x 23.6″ x 34.6″. It’s much easier to store Bugaboo Fox at home or in a car trunk if you remove the seat first. You can even make the stroller more compact and detach the wheels. Dimensions of such a compact fold: 26″ x 21.3″ x 7.5″. 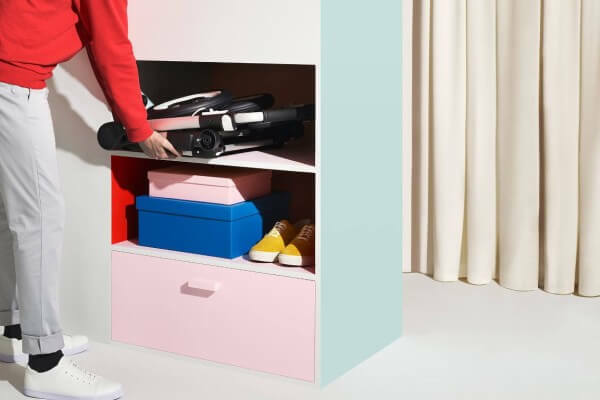 It’s the best way to store the stroller, for example for the next baby. 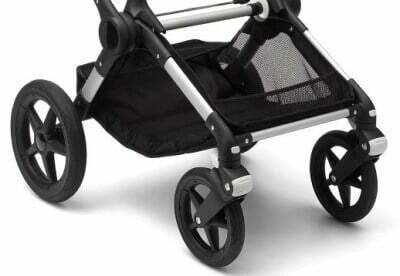 This is a new stroller from Bugaboo and it has been on the market only for few weeks. Last time I checked it on Amazon it haven’t had many reviews yet but you should check on your own if there are more reviews now (check it here). Here are some photos of happy Bugaboo Fox owners, that I found on Instagram. 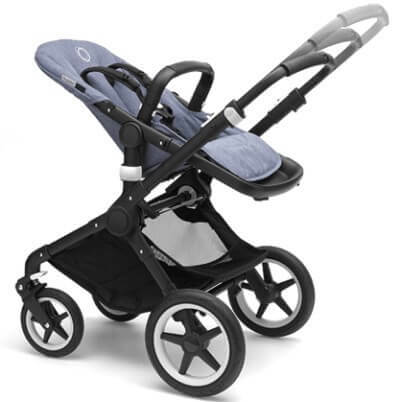 Just like other Bugaboo strollers, Fox is available in many color versions. The famous Dutch brand offers a wide variety of colors for canopy, seat, bassinet and when the chassis, grips and wheel caps! Thanks to such a huge personalization you can create your own Fox, just how you like it (you can do it on PishPoshBaby). The chassis is available in two colors: black and aluminum. The seat fabrics and bassinet (with apron) come in 5 colors: black, grey mélange, green mélange, red mélange and blue mélange. Fabrics for the sun canopy (with UPF 50+) are available in 14 color versions! You can choose neon red, olive green, soft pink, sky blue, ruby red, black, fresh white, sunrise yellow, grey mélange, red mélange, blue mélange, birds, waves or tucan. Faux leather grips (handlebar, belly bar and bassinet carry handle) can be purchased in three colors: black, brown and cognac. Wheel caps are available in 4 color versions: brilliant white, dark red, glossy black and wood. 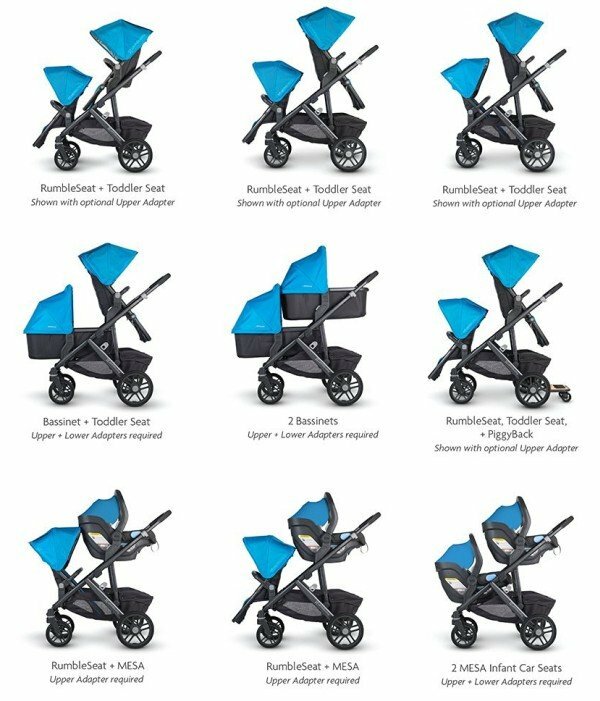 Below you can see all options for each part of the Bugaboo Fox Stroller. Bugaboo offers huge customization for Fox. First choose the color of the chassis. Then pick the color for the seat fabric and bassinet (you can mix or match all colors). Then choose the color for the canopy – you have 14 options! At the end pick the color of the covers for the handlebar and bumper bar, as well as the color of wheel caps. 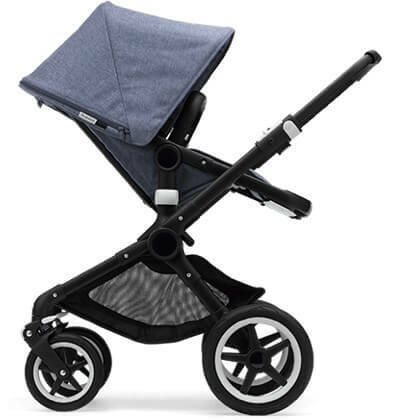 If this is too much for you and you cannot decide which colors to choose for each part, Bugaboo Fox comes in three ready-made versions as well: Black, Blue Melange and Black + Fresh White. You can see them on Amazon. Although Bugaboo Fox is an expensive stroller is doesn’t include any accessories. If you would like to have a cup holder or a snack tray, you need to purchase it separately. Below you can see the most useful accessories that are compatible with Bugaboo Fox 2018. Cup Holder – It’s compatible with all Bugaboo strollers. Thanks to it you can keep your water always at hand or you can put there your baby’s sippy cup. 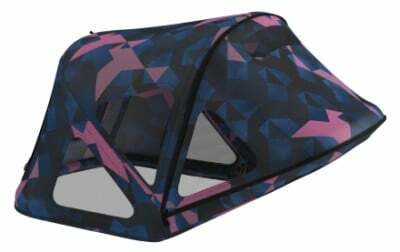 Breezy Sun Canopy – This canopy has nice mesh side windows, small peek-a-boo window so you could check on your baby whenever you want and a front window so the baby could watch the surrounding when he’s still fully protected from sun rays. It’s a great accessory and a must-have on summer, since the canopy included with the stroller doesn’t have any vents or peek-a-boo window. Snack Tray – This tray, designed for Bugaboo Fox, has one beverage holder and enclosed storage for baby’s snacks or small toys. Wheeled Board – Bugaboo Fox is a single stroller, but it allows to attach a board for second, older child. It’s a perfect solution for toddler who usually prefers to walk, but gets tired on longer distances and for a preschooler. Stroller Organizer – Great accessory that allows parents to keep their essentials and personal items within reach. There is a big zippered pouch where you can fit some diapers, wipes, sippy cup and some soothers. There are also two small compartments for your phone, keys and other small valuables. Great thing about this organizer is that it easily converts into a hand bag so you can just grab it and go shopping. So the new stroller from Bugaboo – Fox, is quite similar to the Buffalo as it is supposed to replace this “old” stroller. It has some of the features that Buffalo had, however the manufacturer did improve some of the functions that parents complained about. It has also similar features as the Cameleon3 has. If you’re curious what are the differences between Bugaboo Fox, Buffalo and Cameleon3 or which Bugaboo stroller is right for you, the table below should be helpful for you. At the first glance Fox, Buffalo and Cameleon3 look very similar. However Bugaboo Fox has many improvements which make it much better than other single Bugaboo stroller. It’s lighter, more agile and more easier to navigate on harsh terrain than Buffalo. You can easily push it with one hand and it glides like a breeze even over a grass! I would say Bugaboo Fox is a better, improved version of Buffalo stroller. Moreover, it’s only slightly heavier than Cameleon3, but has bigger front wheels and more advanced suspension which make it suitable for more types of surfaces and the ride is smoother. Fox is easy to maneuver and has much bigger storage basket – perfect for shopping lovers. It’s much more versatile and multi-purpose than Cameleon3. 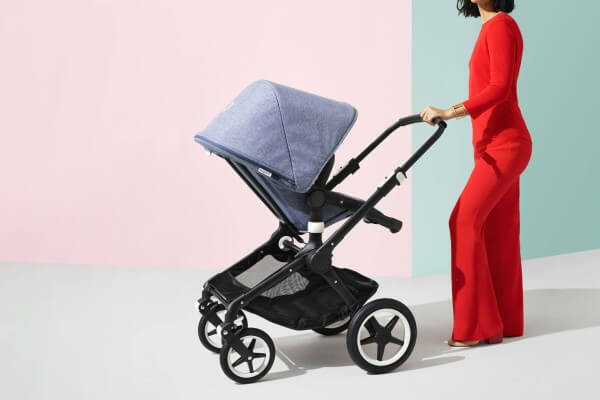 When I saw Bugaboo Fox for the first time I thought that it looks very similar to UPPAbaby VISTA 2018. 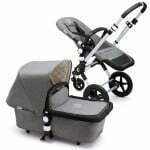 Both strollers are high-end, luxury products made of top-quality materials and they both look stylish and trendy. However there are some important differences which determine which stroller will work better for you and your baby. In the table you can see major differences. 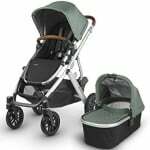 Below there is a detailed comparison of Bugaboo Fox vs UPPAbaby VISTA 2018. The biggest difference between Bugaboo Fox and UPPAbaby VISTA 2018 is the versatility. Fox is designed only for one child, it doesn’t expand to a double stroller. You can attach a wheeled board to Bugaboo Fox for second, older child, but you cannot add second seat, bassinet or car seat. UPPAbaby VISTA 2018 is an expandable stroller which means you can use it as a double stroller: with one or two bassinets, toddler seats or infant car seat, or you can mix the seats if you have kids of a different age. You can also attach a PiggyBack Board for the third, oldest child. As you can see Bugaboo Fox is a great option for example for a newborn baby and preschooler, while the UPPAbaby VISTA is awesome solution for twins + preschooler or newborn + toddler + preschooler. VISTA is significantly heavier than Fox (almost 5 lbs), but it’s still one of the lightest expandable strollers! It is heavier, because it has to be strong enough to hold two or even three kids. Both strollers can handle many types of terrain, even the rough and bumpy surfaces. However, Bugaboo Fox pushes more smoothly as the pressure is distributed across the whole frame. VISTA is also very convenient to steer, but with an older and heavier kid or during going over bumps pushing is a bit harder and you may feel some shocks. Bugaboo Fox works on snow and grass slightly better than VISTA, as the wheels and suspension cushion the ride a bit more. Moreover Fox features two-wheel mode which is very useful when you need to drag the stroller over snow or sandy beach or bring it up stairs. Both Bugaboo Fox and UPPAbaby VISTA have huge storage baskets, however the latter one has even more spacious bin with higher weight capacity (30 lbs, instead of 22 lbs!). Be careful with VISTA’s storage basket – it’s so big that you could easily fit there so many things that weigh more than 30 lbs, but it would decrease stroller’s stability. Another differences between VISTA and Fox is folding mechanism and folded size. VISTA is more easy to close as it takes less steps and can be done within few seconds. Folding Fox is not very difficult, but it takes about 6 steps and a bit more time. Moreover, UPPAbaby VISTA 2018 has very narrow self-stand, especially for a full-sized stroller. 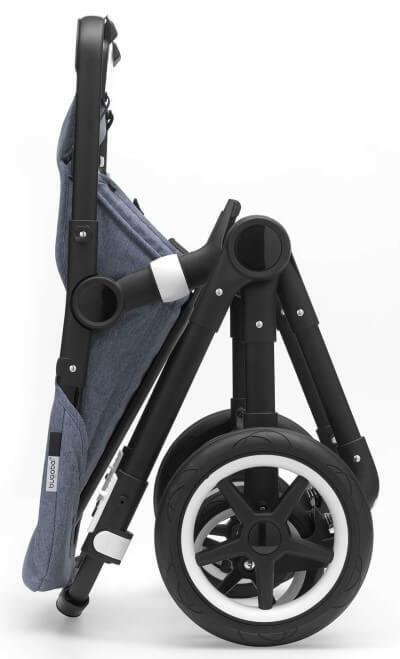 Bugaboo Fox also features one-piece self-standing fold, but the seat sticks out further, making it more bulky and difficult to transport or store. So comparing the one-piece fold (frame + seat) UPPAbaby VISTA is smaller and thanks to that it’s simpler to store at home. However, one-piece fold may not be perfect for transporting in a car trunk (it’s more difficult to lift the chassis and seat at once and it may not fit it). Sometimes it’s easier to detach the seat from the frame and transport two pieces separately. And here Bugaboo Fox wins – the frame itself is small than VISTA’s and both pieces of Fox are more convenient to carry (you can use the belly bar and the bar below the seat as a carry handle). 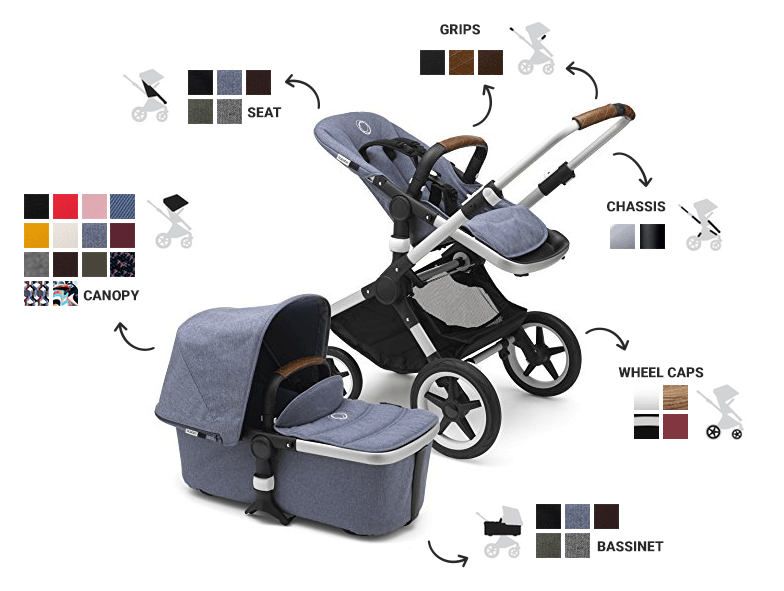 In contrast to Bugaboo Fox, UPPAbaby VISTA is available in only 8 color versions (here you can see the mélange colors). Fox stroller offers bigger customization where you can mix and match colors for the seat fabric, canopy, chassis, grips and even wheel caps! The last big difference between Bugaboo Fox and UPPAbaby VISTA: customization. The former one offers really wide variety of color options. You have 2 colors for chassis, 5 colors for seat and bassinet fabrics, 14 colors for the canopy, 3 colors for faux leather grips and 4 colors for wheel caps! You can mix and match all colors just how you like it. On the other hand, VISTA offers 8 color versions which are really beautiful, but you cannot mix colors of the canopy and seat, you just choose one of the prepackaged color versions. Although this stroller is all-terrain, on very rough, bumpy ground it will bounce a little bit. The ride is cushioned but not as smooth and soft like with jogging strollers. 1. Since it comes with a bassinet and toddler seat it can be used from day one and it can be the only stroller you will even need. 2. This stroller is a pleasure to use for parents: it has one-hand reclining seat, telescoping handlebar and smart parking brake that is easy to use even in flip flops. 3. It’s made of high-quality materials and fabrics – not only stylish and luxurious but also very strong and durable. Do you like Bugaboo Fox Stroller? It’s a really expensive model, so before you decide to buy it make sure it really meets your needs. Bugaboo Fox is not what you need? Check out other awesome strollers for 2019. 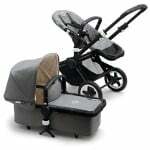 Hi i would like to asked which is better the bugaboo fox or the maxi cosi nova 4? Hi! 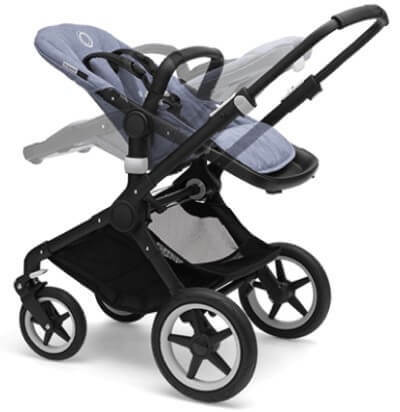 Maxi Cosi Nova has nice all-terrain wheels and good suspension and of course amazing folding mechanism which doesn’t require using hands. It feels strong. But it is SOOO heavy (over 35 lbs for a standard stroller!!). Bugaboo Fox weighs about 14 lbs less and it has a bit smaller fold. I know it may seem irrelevant, but trust me – carrying 35-pound stroller or lifting it to the car trunk (maybe even every day) will quickly get super annoying. Besides, the storage basket is very small on Nova 4 🙁 If you put there a medium-sized diaper bag, there will be no room for extra blanket or even a bottle of water. 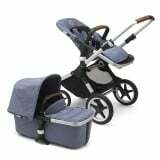 Otherwise, both strollers are quite similar – both have good large canopy, reversible seat and adjustable handlebar, both are compatible with infant car seats. I know that Fox is not perfect and you can find cheaper strollers with similar features, but I think it’s better choice than Nova. Hi Jess! Fox is not designed for jogging and I don’t recommend you using it for that. It has smaller wheels than jogging strollers (8.5” in front and 12” in back, while jogging strollers usually have 12” in front and 16” in back) and the suspension is not as good as in joggers. It’s sufficient for strolls on more rough terrain (like gravel, grass or dirt roads), but only for walking, not jogging. Thanks for this useful review. I wanted to know if this pram would be suitable for jogging?